Tracy's Bits N Pieces: Farm Girl Barns - a finished quilt! Farm Girl Barns - a finished quilt! I finally decided that I really did want to make this beauty a little bit bigger so we could snuggle under it. So, I have started to make some flying geese to fly all the way around it. And, remember this cute little pile of Briar Rose leftovers? They are becoming these cute little granny squares. 14 down. 11 to go. And finally, a fabulous finish! My barns are quilted and bound. Woo hoo! I actually started this quilt a couple of years ago when Lori Holt was doing her Barn Along through her blog. But then the top lingered unquilted. When I saw that she had included her cute little barns in her new book, I knew that this top just had to become a real quilt. Just look at all of these cute little barns. Too hard to pick a favorite. If you have not already bought her new book. Run! Right now! Order it! It is adorable. These barns are in there along with more than 40 different blocks to play with. Thanks for sharing your cheery work today!! I love the little barns and how each one is unique! And your granny squares are lovely. :) I want to try granny squares some time, just need to find the time to tackle them. Your orange peel quilting is superb as well! 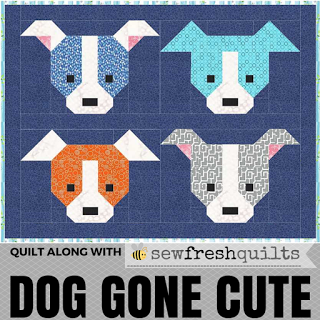 I absolutely love the quilting on your barn quilt! These are so cute! I so regret not making that barn quilt when Lori had her quilt along. It's just perfect! I would like to know more about how to make the granny squares. Looks like both a lot of work and a lot of progress! I just adore the Briar Patch blocks! Such an adorable and fun collection. The barns are just as cute. I really love the different inset blocks. You got me with those granny squares - just love them! I have a FQ bundle of Briar Rose just waiting for the right moment! Oh my goodness!!! Those barns!! And those granny squares!!!!!! Be still my heart! !